Fix Your Cracks! Your Windshield Can Save you in an Accident - Lanes Insurance Inc.
Windshield cracks can happen at a moment’s notice, and through no fault of your own. 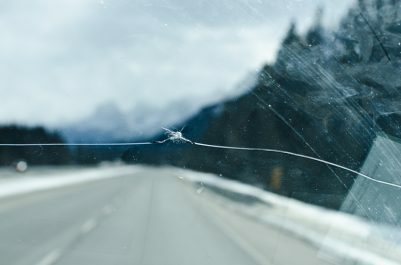 While you may be tempted to brush a small crack off as no big deal or dismiss it as a purely cosmetic problem, the reality is that minor windshield damage poses major safety hazards. Cracks – even small ones – need to be repaired promptly, since there’s no telling when their hidden dangers might put you and your passengers in jeopardy. Cracks in your windshield could stop your airbags from deploying properly. The mechanics of airbag deployment rely on an intact windshield, and if yours is cracked, the airbag could open outwards instead of inwards…and that could have dire consequences. In the event of a roll-over accident, a cracked windshield could lead to your car’s roof giving in when it otherwise would have held up. Such an event would result in a good deal of the vehicle’s weight collapsing in on the passenger seating area, potentially causing serious injury or worse. When you’re driving, your vision could be significantly impaired by a cracked windshield. Cracks can be particularly problematic at night, when the glare of oncoming headlights can flare through the crack, putting the driver and everyone else in the vehicle at risk. Windshield cracks are points of weakness that need to be addressed. Fortunately, they can be repaired in some cases, helping you save some money off the cost of a full replacement. While you’re free to collect multiple opinions, you should always follow the technician’s advice and instructions regarding windshield replacement. Do You Need Glass Coverage? Glass protection is typically included, at least to a partial degree, in most comprehensive car insurance policies. Insurers will normally cover the full cost a windshield repair after you pay your deductible, and in most cases, you won’t have to pay out of pocket and collect a reimbursement — the car glass shop will just bill your insurance company. It’s up to you to decide whether the cost of the deductible and the claim is worth it. You do have the option of waiving your glass coverage if it’s included in your policy if you want to reduce your premiums through what’s known as a 13D endorsement. However, if you choose to do so, be aware that you will be on the hook for the full cost of any necessary glass repairs your vehicle may need. Car insurance professionals generally recommend that you keep your glass coverage intact if it’s part of your policy. However, the decision is yours to make; just be sure to carefully weigh the premium savings against the potential cost of glass damage. Lane’s Insurance is a leading provider of car insurance for individuals as well as commercial clients. If you’re looking for great rates and unbeatable customer service, visit Lane’s today to get a fast, free online car insurance quote from your Calgary brokers.